Dell UltraSharp U3818DW 38 Series LED-backlit LCD 3840x1600 Resolution InfinityEdge Display Curved Monitor 97F8P 097F8P CN-097F8P. IN EASY TO OPEN OEM BROWN BOX PACKAGING! Dell UltraSharp U3818DW 38 Series. 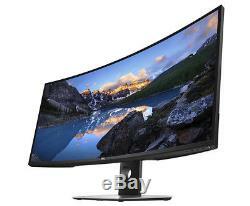 InfinityEdge Display Curved Monitor 97F8P 097F8P CN-097F8P. Dell UltraSharp U3818DW 38-inch curved monitor with an InfinityEdge display. Expansive views and incredible visuals mean fewer distractions and improved multitasking. Dell Part Number: 97F8P 097F8P CN-097F8P Dell Model Number: U3818DW Youll be inspired to do more. The expansiveness of this 37.5-inch curved screen paired with virtually borderless InfinityEdge creates a near-complete field view which provides an almost uniform visual focus that reduces eye movement across the screen. Youll work more comfortably with fewer distractions and more productivity. Gorgeous visuals are only the beginning: Youll be oblivious to distractions. Your 37.5-inch, ultra wide curved monitor has a 21:9 aspect ratio and delivers approximately 25 percent more screen content than a 34-inch. Plus a gorgeous, expansive display with InfinityEdge offers virtually borderless screen. All-encompassing experience: The curved screen delivers a panoramic viewing experience while integrated 9W speakers bring the quality sounda one-two punch that makes this monitor the ideal canvas for video editing projects. More show than tell: You can expect outstanding detail and consistent color across a wide viewing angle WQHD+ 3840 x 1600 screen featuring In-Plane Switching technology. Accurate color, right out of the box: Your monitor comes with 99% sRGB factory calibration for impressively precise color at Delta-E less than 2. Easy on the eyes: This TUV-Certifiedi monitor has a flicker-free screen with ComfortView, a feature that filters harmful blue light emissions to optimize eye comfort. Now you have the screen space, the tools and the features you need to do everything efficiently. Connectivity Options Ports and Slots: 1. USB downstream port with power charging Reliable and responsible Designed with the environment in mind, this monitor meets the latest regulatory and environmental standards such as RoHS compliance, China Energy Label (CEL), WEEE, ErP (EuP) Standards, Korea E-Standby. The advertisement of any product does not constitute an offer to sell. Your order does not signify our acceptance of your order, nor does it constitute confirmation of our offer to sell. We reserve the right to accept or decline your order. This agreement shall be construed under and in accordance with the laws of the state of Ohio, and all obligations of the Parties created in this Agreement are performable in Lake County, Ohio, United States of America. You may only place your order if you have read and agreed to these terms. Powered by SixBit's eCommerce Solution. The item "DELL ULTRA SHARP U3818DW 38 LED LCD 3840X1600 CURVED DISPLAY MONITOR 97F8P USA" is in sale since Wednesday, September 19, 2018. This item is in the category "Computers/Tablets & Networking\Monitors, Projectors & Accs\Monitors".